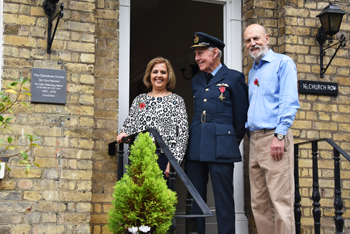 A plaque was unveiled on 24 October 2015 at the former home of Air Chief Marshal Sir John Wakeling Baker GCB, GBE, MC, DFC, ADC (23 October 1897 – 10 March 1978), a senior commander in the Royal Air Force in the mid-20th century. Born in Saskatchewan, Canada, he was educated at Woolwich Military Academy and commissioned into the Royal Garrison Artillery in February 1916. He transferred to the Royal Flying Corps later that year initially as a Gunnery Liaison Officer. He was appointed a Flight Commander inNo. 60 Squadron in January 1924 duringthe War Waziristan, Pakistan. He was awarded the Distinguished Flying Cross in 1925 for his “gallant and distinguished service with the Royal Air Force in Waziristan. This officer showed devotion to duty throughout the operations and set a high example to all ranks. He performed 69 hours war flying as a pilot, which included 35 raids”. Baker was appointed Officer Commanding No. 33 Squadron in 1935 and then joined the Directing Staff at the RAF Staff College in 1939. He served in World War II initially as Deputy Director of Plans at the Air Ministry, and then as Director of Bomber Operations from February 1941. He continued his war service as Senior Air Staff Officer first at Headquarters, Air Forces in India and then at South East Asia Command. He finished the war as Air Officer Commanding No. 12 Group. After the war, Baker became Director-General of Personnel in 1946, Air Officer Commanding-in-Chief at Coastal Command in 1948 and Commander-in-Chief RAF Middle East Air Force in 1950. Baker’s last appointments were as Deputy Chief of the Air Staff in March 1952, Vice-Chief of the Air Staff in November 1952 and Controller of Aircraft at the Ministry of Supply before he retired in 1956. He was representative of the RAF at the funeral of King George VI and appointed ADC to the Queen on Nov 29th 1952. Locally he was President of The Chislehurst Branch of Men of Kent and Kentish Men. He wrote the foreword to Tom Bushell’s Imperial Chislehurst. He was trustee of the garden of remembrance trust to build a garden opposite Sainsbury’s which unfortunately did not materialise. He was a prominent and active sidesman at St Nicholas Church where his daughter was married from 16 Church Row. Sir John died at The Glebe, Chislehurst in 1978 and his widow moved to Leicestershire. A plaque to remember his life was given by the Chislehurst Society, and unveiled on 24th October, in the 75th Anniversary year of the Battle of Britain. Air Commodore John Bell OBE unveiled the plaque to Air Chief Marshal Sir John Wakeling Baker at 16 Church Row. The unveiling at the home of Mr and Mrs John London was a fitting occasion attended by RAF veterans, former Chislehurst MP Sir Roger Sims, Roger Faux, current chair of the Men of Kent, history group members, neighbours, and Roger and Ken Speers who recalled Sir John from their days as choir boys at St Nicholas. See more images from the unveiling (with thanks to Don Drage).